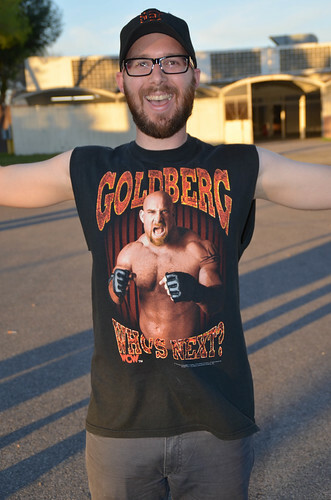 Personally I was never a fan of Goldberg. It was cool to see him squash people at the start of his career, but his matches were not progressing. Later I hear an interview with Goldberg where he said his inspiration for his character was Tyson and the way Tyson would wreck the other guy in 90 seconds. While that sounds good, it gets boring after a while when it comes to pro wrestling. Tank Abbott was not the best MMA fighter, but he had a cult following. Even if he was not undefeated, he still had a rep for being tough. This shows us how pro-wrestling us about presentation. Goldberg looks more athletic than Tank Abbott's street fighter persona. I cannot think of the last wrestler in WCW/NWA/JCP who had that street fighter look. Tank's MMA/UFC rep could not follow him into WCW. He still had to be built in the world of pro wrestling. When I look at Tank Abbott's WCW run, I think he was not used well. This is not surprising for the state of WCW at the time. Other than Ronda Rousey, a US wrestling promotion has not shown the ability to have a known MMA fighter or champion come in and be successful.